How can I protect my child from heat-related illnesses? 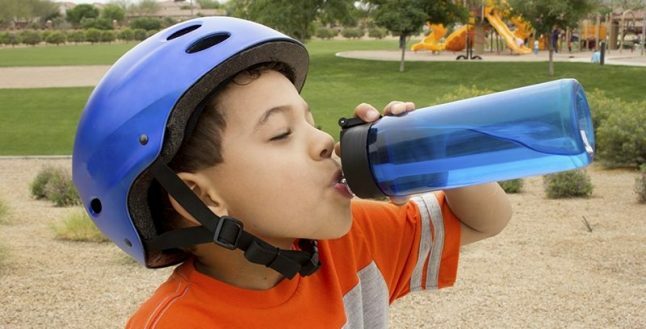 Children are at risk for heat-related illnesses when exposed to heat and humidity without proper hydration. What is a heat illness? When your child’s body produces too much heat (e.g., when running vigorously) or is unable to cool down when exposed to intensive heat (e.g., sitting in a hot car with the windows rolled up), it struggles to maintain a normal internal body temperature. “In such conditions, dangerously high body temperatures can cause heat-related illnesses such as heat exhaustion and the most severe form, heat stroke,” says Thomas Jacob, MD, UCLA pediatrician in Torrance. Heat stress and exhaustion typically result from exposure to high heat without adequate fluid and salt replacement. If exposure to heat and humidity is physically intense or prolonged, a child may be at risk for heat stroke. In hot, humid weather, evaporation of sweat – one of the body’s primary cooling mechanisms – is hindered, overloading the body’s ability to regulate its core temperature. During a heat stroke, your child’s body temperature will increase rapidly, compromising the central nervous system and potentially leading to confusion, decreased mental acuity and seizures. Symptoms of milder forms of heat illness, such as heat stress and heat exhaustion, include nausea, fainting and weakness. Treatment involves immediate removal from exercise/exposure to heat, promptly followed by rehydration. If your child is experiencing a heat stroke (body temperature higher than 104°F), move your child to a cooler location and contact a medical professional immediately. Apply cool cloths to your child’s body and remove any excess clothing but do NOT give him/her fluids. Additional cooling and treatment should be administered under the supervision of a medical professional. If untreated, heat stroke can cause damage to the brain, heart, kidneys and muscles.